Who will survive the attack of the killer lions in ROAR? No animals were harmed in the making of this movie. 70 members of the cast and crew were. 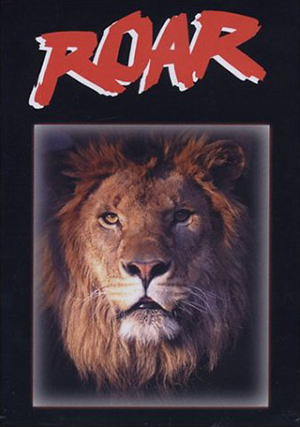 An unprecedented––and wholly unpredictable––action-adventure, Roar follows wildlife preservationist Hank (The Exorcist producer Noel Marshall in his sole and career-derailing turn as an actor and director), who lives harmoniously alongside a menagerie of 100+ untamed animals, including cheetahs, elephants, lions and tigers on a preservation in the African plains. When his wife and children arrive (real-life wife Tippi Hedren, The Birds, and step-daughter Melanie Griffith, Working Girl) for a visit, a long-brewing battle for dominance between the lions erupts and threatens their very lives. Part of Nitehawk’s July ANIMAL ATTACKS! midnite and brunch series.